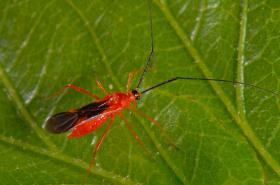 Helopeltis bugs, also known as mosquito bugs or mirid bugs are slender, delicate insects, about 7- 10 mm long with long legs and antennae, the antenna being nearly twice as long as the body. The females are red and the males brown to yellowish red. They lay eggs inserted into the soft tissue near the tips of flowering or vegetative shoots. Nymphs (immature bugs) are yellowish in colour. Both adults and nymphs feed on young leaves, young vegetative and flowering shoots, and developing fruits. Attacked leaves are deformed and show angular lesions, particularly along the veins, which may drop off, so that the leaves appear as if attacked by biting insects. Feeding on the stalks of the tender shoots causes elongated green lesions, sometimes accompanied by exudation of gum. Severely damaged shoots die back due to the effect of bug saliva in combination with fungi, which enter the plant tissue through the feeding lesions and the subsequent development of numerous auxiliary buds causes a bunched terminal growth known as 'witches broom'. In case of serious infestations the trees may appear as if scorched by fire. Bug feeding on developing fruits causes brown sunken spots. The growth of trees is seriously retarded and fruit formation is reduced. Conserve natural enemies. Weaver ants build nests on mango trees providing good protection against this and other bug pests. 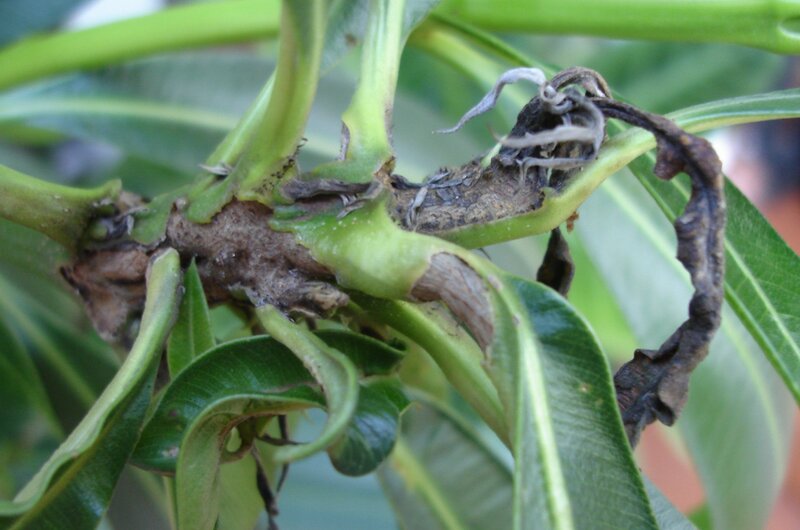 Do not interplant mango with crops that are host for Helopeltis bugs, such as cotton, tea, sweet potato, guava and cashew.